Most people confuse topics like an Energy Star rating with how efficiently their heating and cooling system is really operating. National Comfort Institute (NCI) Certified Professionals use what they call either a HSER™ (Heating System Efficiency Rating) or CSER™ (Cooling System Efficiency Rating). HSER & CSER are an efficiency rating of your installed system, including the effects of the ducting and the construction of your home. When a typical heating and cooling contractor quotes the efficiency of the equipment and leads you to believe the new equipment will automatically deliver that efficiency, think again. Typical installed equipment only operates at 55% to 70% of rated capacity. An NCI-trained and certified contractor will field-measure the installed efficiency of your current system. Your contractor may then recommend improvements while installing your new equipment. He will then measure the new system’s performance to prove the new system is functioning as designed. 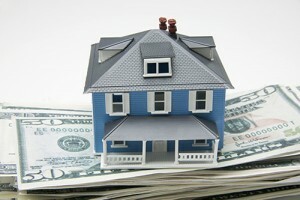 By taking this approach your contractor will help insure that you get the comfort and energy savings you’re paying for. When an NCI-certified contractor measures the SER™ of your system, the test reveals the ratio of actual heating or cooling delivery compared to the rated amount the equipment produced when the manufacturer tested the equipment. For example if an air conditioner worked perfectly, it would be rated at a CSER™ of 100%. But if it only delivered half the cooling, the CSER would be 50%. 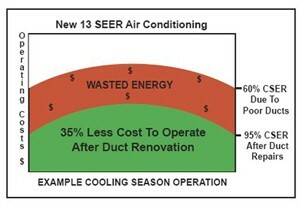 In other words, a 14-SEER rated air conditioning unit would only operate like a 7-SEER rated unit. Your certified contractor can fix many of these problems and increase your HSER and CSER. An NCI-certified Combustion Analyst can also measure and adjust your furnace’s combustion efficiency for maximum fuel savings. Make sure to set aside ample time for your contractor to test your system. The time required depends on the size of your home. Normally, the testing takes between one and two hours. But stay for the show. The testing is clean, informative, and entertaining. It’s important to understand that equipment ratings are only the potential efficiency of that component of the system under perfect conditions. Think of it as trying to rate your car’s MPG based on just testing the motor by itself. 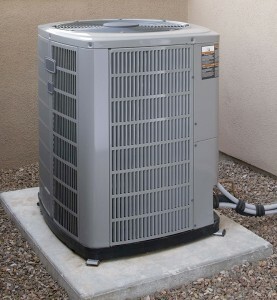 Over half of an air conditioning or heating system’s efficiency depends on the duct system and the field-installation. Your expectations should be realistic. Most homes will never rate at 100% efficient. It has been done before, but it’s very difficult. CSER and HSER ratings of 90% or better are frequently achieved through an NCI-certified professional. What’s more important is that your current system’s efficiency can often be increased by 25% to 50%. The biggest benefit is the increase in comfort that you will enjoy every day by actually getting the heating and cooling you’re paying for! Plus a financial benefit of more efficiency. Don’t be fooled by imitations. Only through NCI certification are HVAC technicians qualified to perform this testing. Most contractors simply aren’t willing to invest in the tools and training to provide this valuable service.